NOTE ON TAX DEDUCTED AT SOURCE (TDS) UNDER THE GST LAW. EXCISE AND TAXATION DEPARTMENT, HARYANA. TAX DEDUCTED AT SOURCE (TDS) UNDER THE GST LAW. > TDS is the tax deduced at source from the payments made to a supplier of taxable goods or services or both. > TDS is to be deducted from payments made to a supplier of any taxable goods or services or both where the total contract of such supply exceeds Rs. 2.5 lacs. > No deduction shall be made if the location of the supplier and the place of supply is not in the State of Haryana. > The registration application For Tax Deductor can be filed by the applicant directly or through a Facilitation Centre notified by the Commissioner. > The registration under GST is online by filing application in form GST REG-07, to be signed through DSC or EVC. > The single portal for registration, payment and filing of Returns is www.gst.gov.in. > The existing deductors of TDS under VAT Act will not be automatically migrated to GST. > The GST Law provides for compulsory liability of registration for the deductors of TDS. > On account of deferment of TDS provisions in GST, Registration for the same will commence from 25th July 2017. > Applicant must have valid PAN or TAN. > Applicant must have a valid mobile number. > Applicant must have valid E-mail ID. > Applicant must have the prescribed documents and information on all mandatory fields as required for registration. > Applicant must have a place of business. > Applicant must have an authorized signatory with valid details. > There are 3 types of taxes in GST – Inter-state Goods & Service Tax, Central Goods & Service Tax and State Goods & Service Tax. > The deduction against intra-state (within the state) supply will be Central GST & State GST @ 1% each – to be deposited with the respective Governments. > The deduction against inter-state supply will be IGST @ 2%, to be deposited in the said account. > The deductor to generate a challan online in FORM GST PMT-06 on the Common Portal and make the payment to a Bank through e-payment mode [Net Banking/Debit-Credit card/NEFT-RTGS] or OTC Mode [Cash/Cheque/DD]. > In case of default to pay the deducted TDS to the Government within 10 days after the end of the month in which such deduction is made, interest @18% shall be payable in addition to tax deducted. > The deductor is liable to pay a penalty of Rs. 10,000/- or an amount equivalent to the tax not deducted or short deducted or deducted but not paid to the Government, whichever is higher. > Monthly return in form GSTR-7 to be filed by all deductors, online within 10 days after the end of such month. 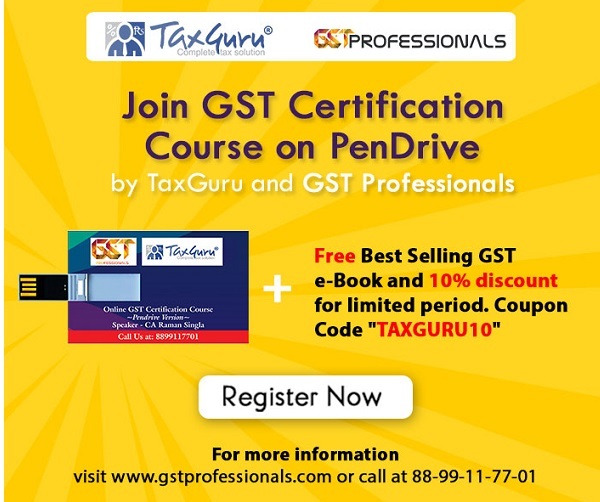 > The deductors shall furnish to the deductee (the supplier) a system generated certificate in Form GSTR-7A, within 5 days of crediting the amount so deducted to the Government, mentioning therein the contract value, rate of deductions, amount deducted, amount paid to the Government and other related particulars. > If the deductor fails to furnish the said certificate within the 5 days period, the dedcutor shall pay a late fee of Rs. 100 per day from the day after the expiry of such five day period until the failure is rectified. The maximum amount of Late Fee payable is Rs. 5000/-.